ISTANBUL, Aug. 2 (Xinhua) -- Turkish small business owners are alarmed by the sharp decline in the value of Turkish lira against the U.S. dollar, as the exchange rate hit a new record low on Thursday. Lira's exchange rate tumbled further a day after the United States sanctioned two Turkish ministers over the continued detention of U.S. pastor Andrew Brunson, who faces trial for espionage and involvement in the failed coup in 2016. Many small business owners in Istanbul are worried that they could go bankrupt if lira further depreciates. 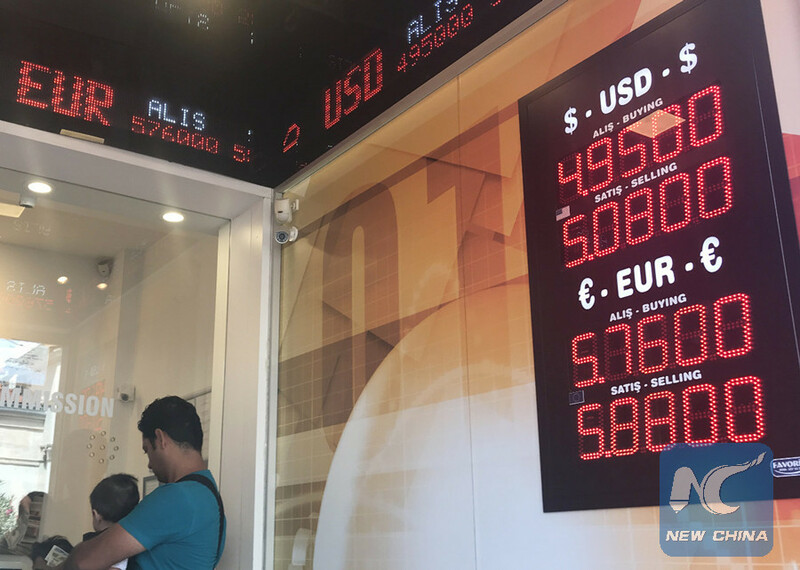 "I cannot believe the devaluing speed of the lira, it was about 4.90 yesterday, hit 5.08 half an hour ago and now it is 5.09," Necmettin Mansuroglu, owner of two spa centers in Taksim neighborhood, told Xinhua on Thursday. The situation is particularly worse for the companies or shops around the central Taksim Square, the most important tourist spot in the city, Mansuroglu said. "We are directly exposed to currency fluctuation as most of the rents here are (paid) in dollars," Mansuroglu noted. "I pay the salaries of my employees in dollars, and my expenses keep increasing accordingly, but my income shrinks in line with the Turkish lira," he said. Besides the currency fluctuation, the Turkish economy also struggles with high inflation, which scored its highest record in 14 years at 15.39 percent in June. In Mansuroglu's view, if things continue to go at this pace, many small enterprises may go bankrupt. "I don't know how long I will be able to survive in the business," he said, adding that he already closed four of his six spa centers. Raif Hacizade, owner of a bar in vibrant Istiklal Street, had the same worry about the currency decline. The increase of the dollar's value will considerably affect those who have debts in the greenback. "It is getting harder for most of us to overcome these conditions," he said, urging the authorities to resolve the Turkey-U.S. political tension to prevent the losses of Turkish people. Turks are now waiting for positive news that the dispute between the two countries would ease in the very near future. The market, however, is still tense, according to Veli Kocaturk, general director of a brokerage company Isik FX. "The uncertainty about what can be the U.S. economic sanctions against Turkey increases concerns and prevents dollars to regress down to 4.90 levels," he was quoted by Bloomberg HT as saying. Turkish lira has so far marked a loss of over 20 percent since this year. A Turkish court on Tuesday rejected an appeal for Brunson to be released from house arrest during his trial on terrorism charges, triggering outrage of Washington. A day after the court decision, the U.S. Department of Treasury announced sanctions on Turkey's justice and interior ministers, citing their roles in the detention of the pastor. The 50-year-old Brunson, who was detained two years ago, faces up to 35 years in prison if found guilty.